NYnews52: Hassanal Abdullah, poet, novelist, critic, and the editor of Shabdaguchha, an International bilingual poetry magazine, who is also the advising editor of NYnews52.com, received Homer Medal (Homer European Medal of Poetry and Art) at the week-long International Silk Road Poetry Festival in Szechuan, China in June 2016. The president of the Homer Medal Committee, Dariusz Tomasz Lebioda, a Polish poet and publisher, presented him with the Medal. 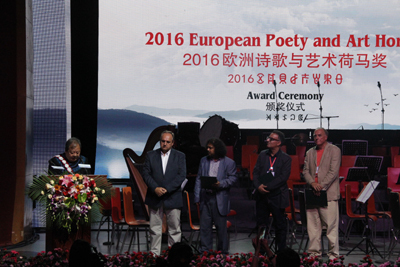 Jidi Majia, a Chinese poet, Bill Wolak, an American poet, and Jalal el Hakmaoui, an Arabian poet, also received the Award. They received the award for their outstanding contribution to the contemporary world poetry. Earlier the year, Mr. Abdullah was nominated for the award by his publisher, Stanley H. Barkan, a major American poet.